Hello my wonderful readers, i hope you are having a sunday as wonderful as i am having. After spending the day yesterday shopping in Liège and cooking since we had family over in the evening, i have today a bit of a relaxed day. On top of that, the best husband in the world went shopping for me and bought everything to install me a wonderful little make up space. We have moved recently into our first own house and we were finally able to create a space which is 100% us. So we have been busy bees painting, buying furniture and decorating. In the bathroom we finally got two sinks and a huuuge mirror. I even had the builder install a little stone shelf in front of our mirror where i can display all my lovely perfumes and beautiful flacons. Now one thing i did not have taken into account, is that this mirror is now rather far away from myself. It is perfect for getting my hair done and all skin care etc. However, for make up, i just sometimes really need the close up if you know what i mean. 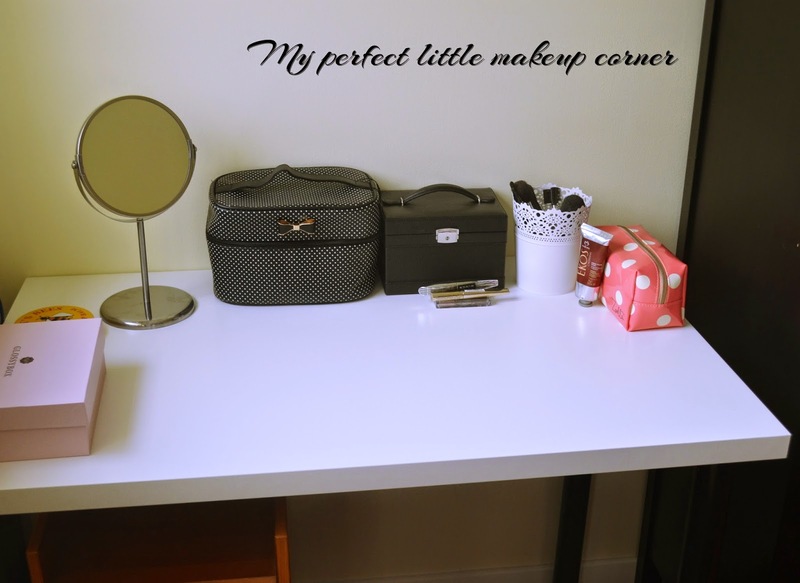 I had been dreaming of getting a dressing table for quite a while but we never had the space and i do not like my make up on my desk since it is already messy enough. So now in the new house i decided to just go for it. I have been spending a lot this year on furniture, renovation, travelling and well quite some clothes and make up and i do have a London shopping trip coming up, so it did not feel right to now spend a huge amount on a make up table. So i came up with a plan for a little budget corner. Yesterday while i went shopping in Primark (which my husband is not a fan off) he went to IKEA and he came back with all ingredients for my perfect little make up corner (i told you he is perfect). He just installed it and i am loving it. I can finally sit down while doing my make up and get all my products spread out without worrying that they will fall into the sink. It also makes a wonderful space for taking photos of products. We just got a white desk top from Ikea (9,90EUR) and 4 table legs (ours where still left over from our old desks but you can get them new for 2,50 each). Under the desk i put a old file cabinet i still had left over to store my make up. I prefer a white one but since that was a bit pricier it will be on the wish list for the coming month. On top i needed of cause a mirror. This one is also from IKEA and came at a mere 5 euro. It has one normal side and one enlarging side (the horror.... but good for eye brow sculpting ;) ). For my brushes i got a bloggers favourite. An ikea flower pot for 2,99EUR. So my whole make up table set up came in for me at around 18 euro. I then added my new make up bag which i got in primark and i used one of my old glossy boxes for all my nail polishes. So what do you think of my new little make up space? Do you have a dressing table? Let me know in the comments. ooh so sweet, is that in the bedroom?